Distemper in dogs, which is highly contagious, can be a fatal disease that is seen in canines worldwide. Though its prevalence has diminished greatly due to vaccination, distemper cases and outbreaks are still seen sporadically. Canine distemper is a sometimes fatal virus that can also infect several other species including ferrets and wild animals such as coyotes, foxes, wolves, skunks, and raccoons. Canine distemper is caused by the canine distemper virus. Animals usually become infected by direct contact with virus particles from the secretions of other infected animals (generally via inhalation). Indirect transmission, carried on dishes or other objects, is not common because the virus does not survive for long in the environment. The virus can be shed by dogs for several weeks after recovery. Puppies under 4 months of age (before vaccinations are fully protective) and unvaccinated dogs are most at risk. Because canine distemper also occurs in wild animals, contact with wild animals may contribute to the spread of distemper to domestic dogs. Because signs are variable and may take time to appear, and secondary infections are common, diagnosis of distemper can be complicated. Additionally, other infections can produce similar signs to distemper. A variety of laboratory tests can help confirm the diagnosis (and some may be done to rule out other infections). There is no cure for the distemper virus, so treatment involves managing the various symptoms and secondary infections. Even with treatment, distemper can be fatal. Treatment depends on the symptoms shown and may include fluids to combat dehydration, medication to reduce vomiting, antibiotics and other medications to treat pneumonia, antibiotics for secondary infections, and anticonvulsants to treat seizures. Neurological symptoms may get progressively worse and not respond to treatment, and even with recovery, some neurological effects may persist. Vaccination is effective at preventing distemper. Puppies are typically vaccinated starting at 6 weeks of age and at regular intervals until they are 14 to 16 weeks old (as with other vaccines, the presence of antibodies received from the mother can interfere with vaccines so a puppy is not considered fully protected until the final vaccine in the series has been given). Vaccination should be repeated a year later, then at regular intervals. Your vet will discuss an appropriate vaccination schedule for your dog based on your dog's history and risk factors. Until puppies have received all the vaccinations in the series (at 14 to 16 weeks) it is prudent to be careful about exposing them to unknown dogs such as at dog parks to avoid exposure to the virus as much as possible. Dogs suspected of having distemper should be isolated from other dogs, and the other dogs should be vaccinated if they are not currently vaccinated. The canine distemper virus does not typically survive long outside the body so thorough disinfection of the home is not as critical as with some other viruses; routine cleaning with any disinfectant should be sufficient. 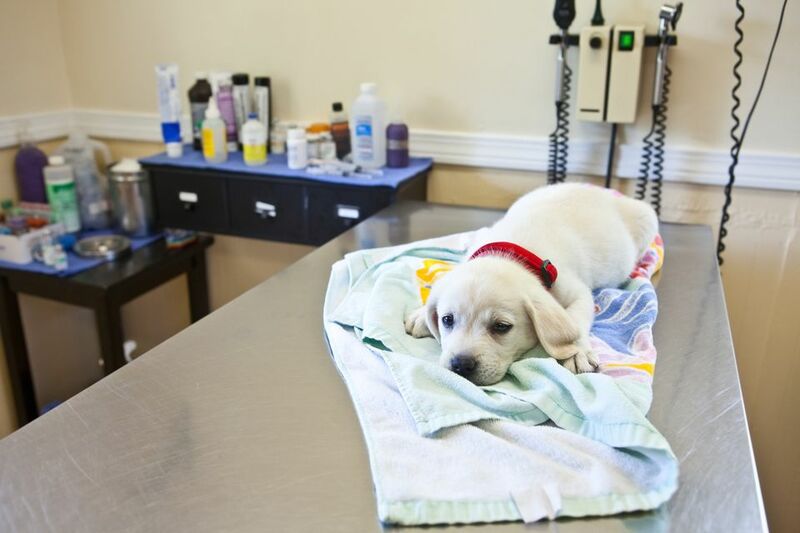 Check with your vet for recommendations on waiting times to introduce a new puppy to a household with a dog that has been diagnosed with distemper.